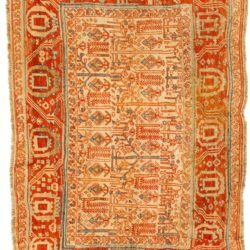 Joseph W. Fell Collection / Semi-Antique Balkan Kilim 6'6"×8'9"
This Fine Kilim rug was woven in the first half of the 20th century in Southeastern Europe, most probably Bulgaria. Good original condition. Bold geometric design that would compliment both Modern or Traditional furniture.